Products Line ['SHEET GOODS' Line] | OSHIKIRI MACHINERY LTD.
Oshikiri uses a standard sheet goods equipment by Moline Machinery Ltd., and then enhances and refines to develop a fully automated system. Now the "MOL" system with automatic dough feeder has Oshikiri original dough sheet former (DSF, Pat. Penned in the USA and Japan). It supplies continuously flat dough evenly. After the MOL system, Dough will be cut for large pieces and storage in the retarder automatically or goes to MOL make-up line for the doughnut, sweet dough, and pies/Danish/pastry. Measurement Feedback system ensures stable dough volume. 25 items can be registered with automatic programmable control. Patented in both Japan & USA. 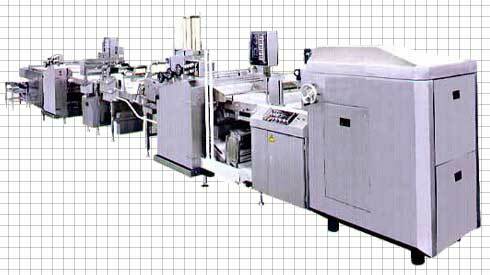 Belt shaped fat is extruded continuously on sheeted dough. Fat is rolled in the dough sheet automatically by folding conveyor. The use of Guillotine cutter enables to cut roll-in dough automatically into fixed cubes. In addition, incorporating Laminator, Sheeter and Panner can make a fully automatic system of cutting, panning and storage in a retarding cabinet; rationalization of the retarding method is possible. Connection to DSF can be mass production line. Connection to MOR can be total continuous sheet line. Multiple leg line is available. Dual piston system minimizes change of fat rheology as these occurs rake kneeding effect. Extruding nozzle gate consists of 3 blades with digital gauge and the fat is free from waving. Folds up dough sheet tightly. Minimum dough layers in final moulded product are available. Select from air cylinder type and servo motor drive type according to capacity and uses. 2 types are available ; front discharge type and edge discharge type. Edge discharge type can be connected to 90° turning conveyor for feeding dough without laminating. Only one way to reduce dough thickness without moving upper and lower layers. 2 types are available ; oscillation roller and sheeter for model DRU. 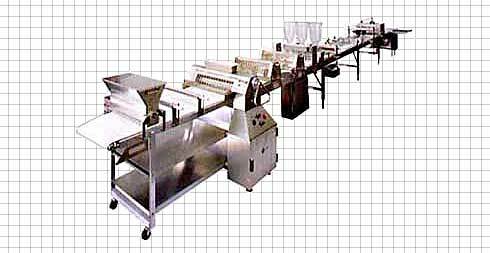 Thickness reduction unit with combination of dynamic action roller and sheeting roller. Larger thickness reduction rate can be applied, and upper and lower layer will not be moved. Patented in USA, Patent Pending in Japan. 1-, 2- and 3-tier types are available. Each type does not cause difference between upper and lower layers. Various accessories are available such as rotary cutter, etc. This equipment is Croissant former itself, and can be combined with "MOL"(make-up) equipment. Creates a handmade taste of clear cutting edge. Core of beginning of rolling can be firmly rolled. Number of rolling is adjusted by Sheeting roller. Upper unit is detachable and can be a work conveyor.